Some of the happy raffle winners at our Belmont party. The parties in New York were so special to us because it was one of the very rare occasions where we got to see what In geveb looked like face-to-unpixelated-face. In geveb usually exists only online—and not just the journal itself, you knew that, but also all of the work that goes into creating it by our editors and contributors around the country and the world (spare a thought for the current editorial staff trying to schedule meetings that work for a university lecturer in Illinois, a grad student in Pennsylvania, a writer in New York, a translator in France, and the various small children that follow some of these people around). So every time we have the chance to see in person the community that creates this project, well, we like it. 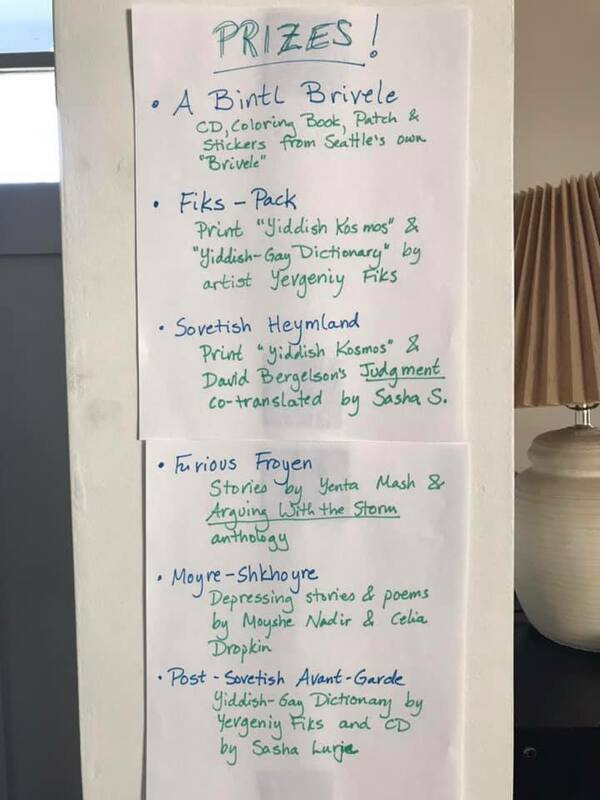 So this year we listened to those far-flung voices and organized the first events in an ongoing series of In geveb house parties as a way to create these wonderful in person experiences in many more of the places where you, dear readers, actually live. In January we held our first ever non-New York event in Seattle followed shortly by our second event in Belmont, Massachusetts. Read on to see some of the fun. 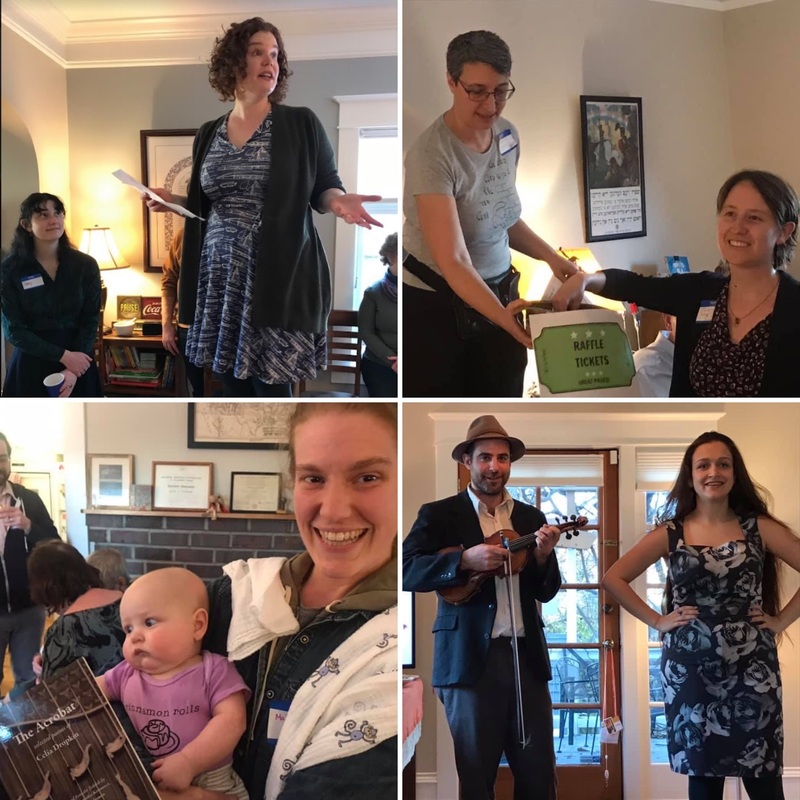 At our Seattle party, clockwise from top left: editorial board member Sarah Zarrow explains the deal with In geveb; expert raffle organizer Faith Jones is assisted in the draw by Liora Halperin; Craig Judelman and Sasha Lurje perform; and young readers have their eyes opened by Celia Dropkin. Thematically organized raffle prizes in Seattle. Our Seattle party was co-hosted by an international dream team from both sides of the nearby U.S.-Canada border: Liora Halperin, Faith Jones, David Morrill Schlitt, Sasha Senderovich, and Sarah Zarrow. A performance by Berlin-based musicians Sasha Lurje and Craig Judelman was the highlight of the event, vodka was drunk from bankes, and the raffle prizes were thematically organized. 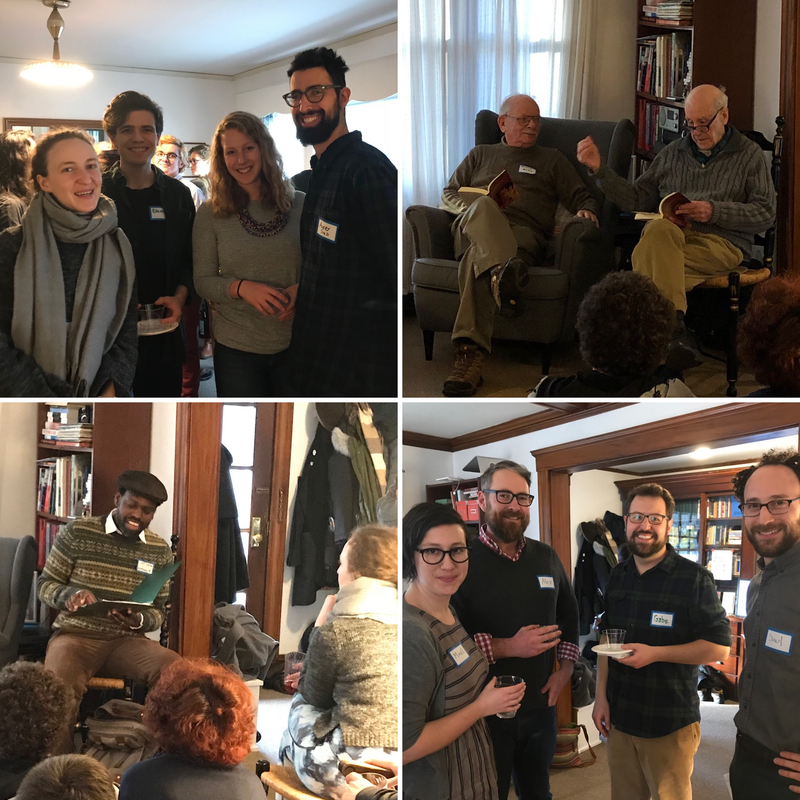 Spotted at our Belmont party, clockwise from top left: two mavens of Yiddish song, Reyna Schaechter and Leah Reis-Dennis; Solon Beinfeld and Richard J. Fein read Sutzkever; editors Madeleine Cohen and Saul Zaritt work on their shmooze; and Anthony Russell performs songs from his new album. The Belmont party was treated to a reading by Richard J. Fein of his newly published translations of Avrom Sutzkever, with Solon Beinfeld reading the original Yiddish poems. Anthony Russell performed several songs from his new album, Convergence, and the raffle was enthusiastically—if amateurishly—curated by Madeleine Cohen, our senior editor, and the host, In geveb’s founding editor Saul Zaritt. These first two events have brought together over 70 of our readers, editors, and supporters, and have been meaningful fundraisers for the journal. We’re really excited about this opportunity to bring together In geveb’s community around the country and internationally, so stay tuned for future events this spring and summer. And if you, dear reader, are interested in hosting or helping to organize an event near you, please be in touch! 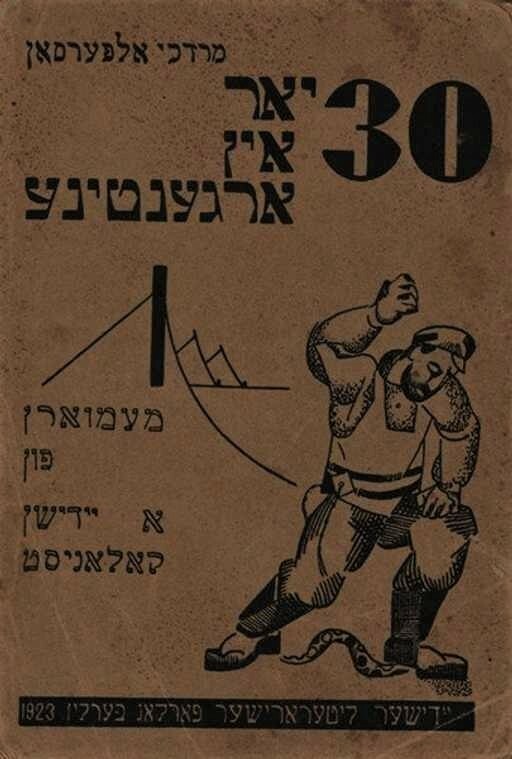 We are grateful to everyone who hosted, attended, donated, and donated items for the raffle, which included: Judgment, Messiah in America, Soviet Moscow’s Yiddish-Gay Dictionary, prints from Yevgeniy Fiks’ project “Sovetish Kosmos, Yiddish Cosmos,” The Acrobat, swag from the band Brivele, Convergence, The Full Pomegranate, and Semer Ensemble: Rescued Treasure. Finally, our continued thanks to The Naomi Foundation for providing financial support to underwrite these events. Editors, The . 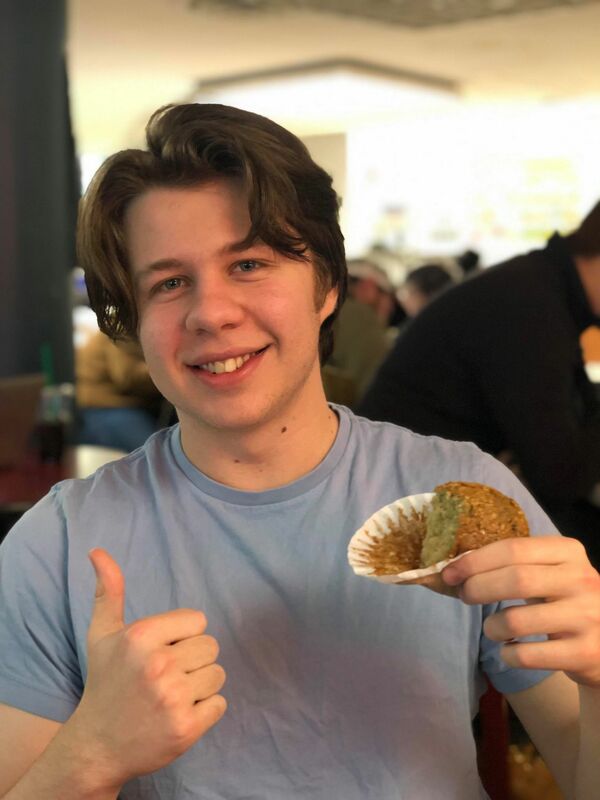 “Supporting In geveb from Coast to Coast.” In geveb, February 2019: https://ingeveb.org/blog/supporting-in-geveb-from-coast-to-coast. Editors, The . “Supporting In geveb from Coast to Coast.” In geveb (February 2019): Accessed Apr 21, 2019.